Do you have a IP multiplexer? Do you have Internet connection in your headend? If you said yes to both question now you can use our cloud EPG to insert EPG in your channels. Cloud EPG lets you to generate EIT tables and send them via UDP to your router. No EPG hardware. No rack space usage. No power supply costs. No air conditioning effort. Just receive your EPG data and use them in your multiplexer. Fast and easy to integrate. Cloud EPG offers you all Tmira`s EPG servers powers in a portion of its price. Same performance, flexibility and reliability with no hardware invests. It is quite easy to integrate with your headend infrastructure giving your viewers a scalable service that you pay as you use. Different from the traditional model, in Cloud EPG the service is already installed and configured. This reduces the time spent in installation and configuration, and can reduce the issues that can get in the way of the default deployment. Maintenance costs are reduced as well, since Tmira owns the environment and it is split among all customers that use that solution. 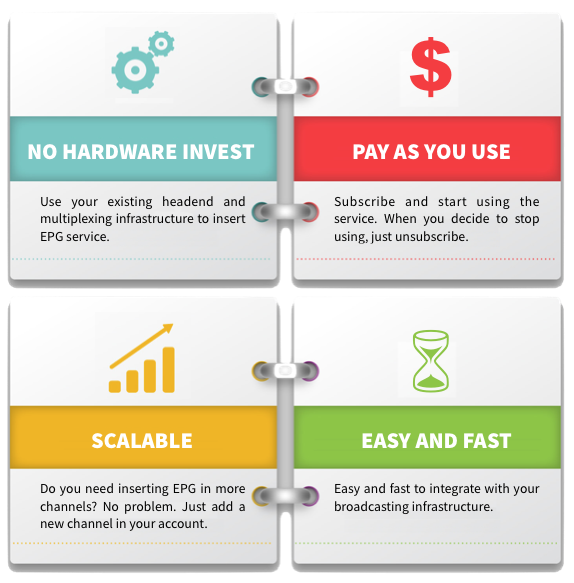 Cloud EPG is scalable and have integration with other SaaS products. Comparing with the traditional model, users do not have to buy another server or software. They only need to enable a new Cloud EPG channel and, in terms of server capacity planning, Tmira will own that. Tmira upgrade the solution and it becomes available for their customers. Costs and effort associated with upgrades and new releases are lower than the traditional model that usually forces the user to buy an upgrade package and install it, or pay for specialized services to get the environment upgraded. Cloud EPG is easy to use since it already comes with web editors and samples inside it. Users can do proof of concepts and test the software functionality or a new release feature in advance. Even for large environments, users can use Cloud EPG to test the software before buy one of our hardware servers. You can use our web interface to insert and edit your scheduled events. Or you can create and host a XMLTV file that will be parsed to create the EPG data in our service. Give us the channel DVB triplet (network ID, TS ID and service ID) and select target IP where you want to receive the generated MPEG-TS. Configure your router to forward the UDP traffic to your multiplexer and finally insert the EIT PID in selected channel. Do not hesitate to contact us if you need more information or want to request a demo.